One of the best ways of protecting your teeth and gums is with preventive dentistry. By catching issues such as tooth decay and gum disease early, treatment can be prescribed before these dental problems become worse. Digital x-rays allow your Celina family dentist, Dr. Angela Ganjoor, to look beneath the gums and inside the teeth, to maximize dental health. Dr. Ganjoor and our team at Celina Family Dentistry strive to give our patients comfortable dental care. 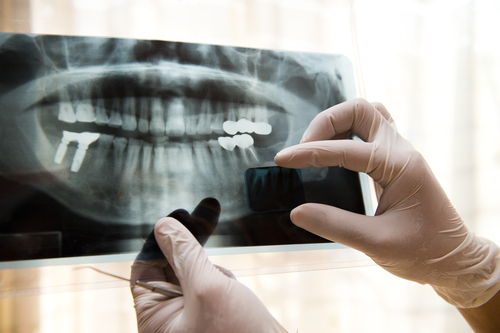 Digital x-rays offer a safe method of examining teeth and bone. Older x-ray machines give off high levels of radiation, while the digital models emit about 90% less radiation. Traditional, dental x-rays also require the use of harsh chemicals to develop the images. Digital x-rays provide instant images of a patient’s teeth and gums, allowing Dr. Ganjoor to show patients trouble spots and discuss a treatment plan right away. The images can also be enlarged and enhanced, to allow Dr. Ganjoor to observe details in your teeth that weren’t visible with traditional x-ray machines. Attending regular checkups is essential for preventive care. In addition, always maintain proper dental habits. Brush your teeth twice a day, and floss at least once. Try to eat a balanced diet, and avoid foods and drinks high in sugars and other starches. These simple steps will reduce your chances of developing serious dental issues. Do you need a checkup or cleaning? Contact Dr. Ganjoor today! Schedule an appointment with our 75009 dental office by calling (214) 851-0130 today. We provide the latest cosmetic and restorative dentistry procedures. Located in Celina, we proudly serve patients from Prosper, Frisco, Allen, and neighboring communities.